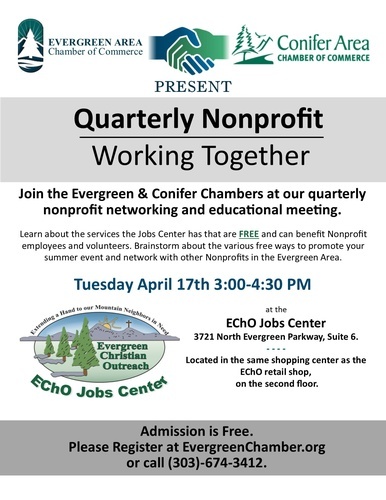 Join the Evergreen and Conifer Chambers at our quarterly nonprofit networking and educational meeting. Learn about the services the Jobs Center has that are free and can benefit Nonprofit employees and volunteers. Brainstorm about the various free ways to promote your summer event. EChO Jobs Center, 3721 North Evergreen Parkway, Suite 6 -second floor, same shopping center as the EChO ReSale Shop.